Inky Impressions, Midnight Madness, and CAS! Hello! I decided to make a card for a couple of challenges today : ) The first is for the Inky Impressions Challenge #22 to use Melon Mambo, Bermuda Bay, and Chocolate Chip. The second is for this week's Midnight Madness Sketch Challenge #27. I used this adorable Inky Impressions image called Lili's Slumber Party. My next card I made for yesterday's Clean and Simple Challenge on SCS to use white plus any other color. I actually used cream instead of white but don't tell anybody : ) I used this awesome set from PTI called Life. I will leave full recipes for both cards below. Thank you so much for stopping by today! A BIG WARM WELCOME to the Midnight Madness Sketch Challenge. We are so happy that you have found us and decided to play along. Very cute image, great colors and love that polka-dotted bow. The MMDesign Team thanks you for playing with us this week!! Greetings and Welcome to the Midnight Madness Sketch Challenges. We are so happy to decided to join us. You color combination is so attractive and appealing to the eye. I love your image and that little bear. This is just as sweet as can be. You had a very successful day crafting as I like your Cream and Black card as well. Awesome. Thanks for playing along with us this week. We appreciate your sport. I don’t know what it’s called, but I like it when you do that shadow thing around the colored image…really cool effect. And look at that black and white card!! – THAT is stunning!! That big ol’ flouncy ribbon is soooo rich! Oh she is simply adorable, very cute. 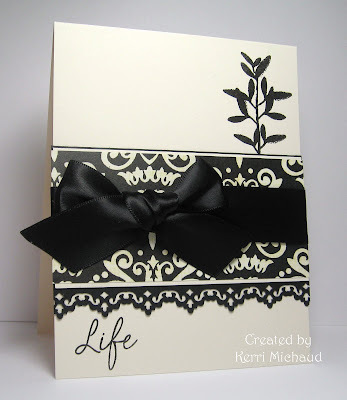 Beautiful black and white card! I really like both of your cards. Great coloring of your image too!. Your punched trim just sets off your beautiful card perfectly. Thanks so much for joining us this week at MMSC! Hi Kerri~ Welcome to the MMSC. I love the card you created for us. Great colors and coloring. A super sweet card!! I love your other card too. So very elegant. Thank you for playing with us at the MMSC this week. We hope you will continue to play with us for a long time to come. Welcome to Midnight Madness, I love both your cards but can relate to your slumber party card with the popcorn, LOL, SO cute and colorful, I'll bring the candy. Fantastic cards! Love the black and white one with that black ribbon. I also like the colors you chose for the first one. Gorgeous cards! I love the colors of the first one! Little girl is so precious! And what an elegant look of the second card! Your MMSC for this week is great Kerri! Love the color combo you used, and that image is just adorable! Great border, flowers and ribbon too! Hello Kerri - welcome to the MMSC - what a great card for your first time too! Love that image and those colours - just gorgeous!! Your colouring is fabulous and I love you eye for detail! This image looks just like my DD2!! Thank you for playing along with the Midnight Madness Sketch Challenge, I look forward to seeing what you will next week!! Kerri Oh my word these are FANTASTIC!!!!! I absolutely love how you used slumber party Lili!! She is just tooo cute...Thanks so much for joining our challenge this week...its ADORABLE!!! Your other card is amazing too!!! WOW I just love looking at your creations! Your black and white (okay, cream and white...shhhh) card is seriously stunning! That ribbon and the punched border and the layout you used. That is amazing! How pretty both of your cards are! I love the black and white elegance of your second card and the sweet image for the MM card is adorable! You did a great job with the sketch! So glad you played along!!! This is stunning Kerri!! I just love your coloring of Lili and your colors!! The flowers and ribbons add such elegance!! Gorgeous take on the sketch!! Love it!! Kerri, Welcome to Midnight Madness, so glad you decided to join us. Your little Inky impressions Lili is just precious and I love how you colored her to match the backgroun dp....awesome work and fabulous coloring!